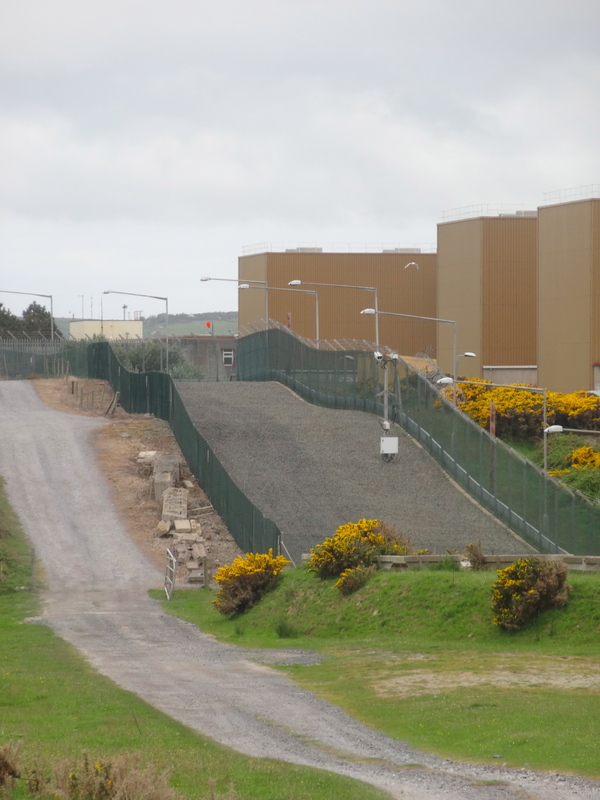 The first few hours of this day, like the end of the last day’s walking, were dominated by Wylfa. 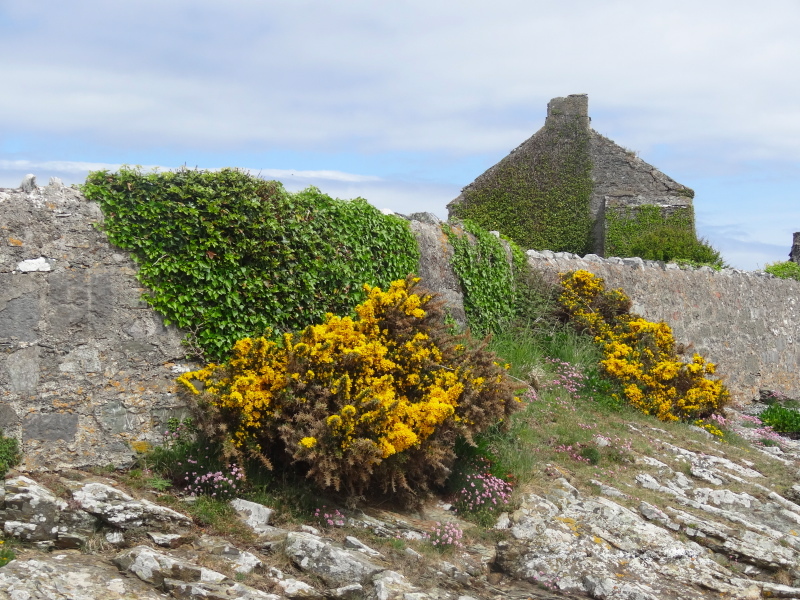 I was dropped by Cemaes harbour to continue where I’d stopped, so took a few photos of the harbour and cottages around it. 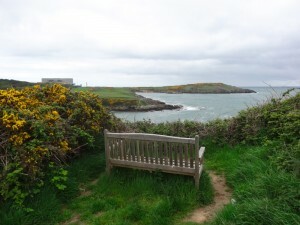 Cemaes is a lovely seaside village, with small boats in the harbour and a small sandy beach. 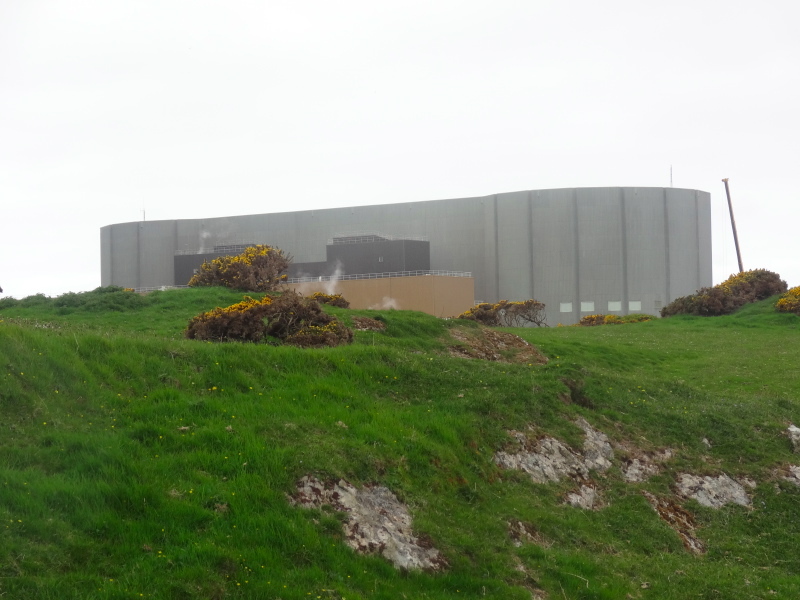 However, just a few steps after leaving it behind Wylfa rises, the vast concrete rectangle of its containment building surrounding by smaller red-brown rectangles, I’d guess full of pipework. There is a second huge, grey rectangle, which at first I took for a second reactor and then realised is the turbine hall. The main reactor has a wide cleared area between security fences, just like the no-go areas in prisoner-of-war films. I recall years ago a school visit to a nuclear plant on the Severn. It was also a Magnox reactor, which is an intrinsically safe design (from a blowing its top point of view), as the operators have to constantly work to stop it from shutting down … unlike a PWR reactor where the operators’ job is to stop it blowing up! The person showing us round said that his only fear for the integrity of the plant was that it sat below one of the main North Atlantic flight paths, and that a plane crash on the plant could break the containment and create what we would now think of as a Chernobyl or Fukushima disaster. "However," he said, "the chances of it landing just here are tiny." This was of course, many years before 9/11. At that point I guess the main terrorist threat would have been the IRA, but now the security is even tighter. The reactor complex extends all the way to the sea, so the coastal path needs to skirt it landward. 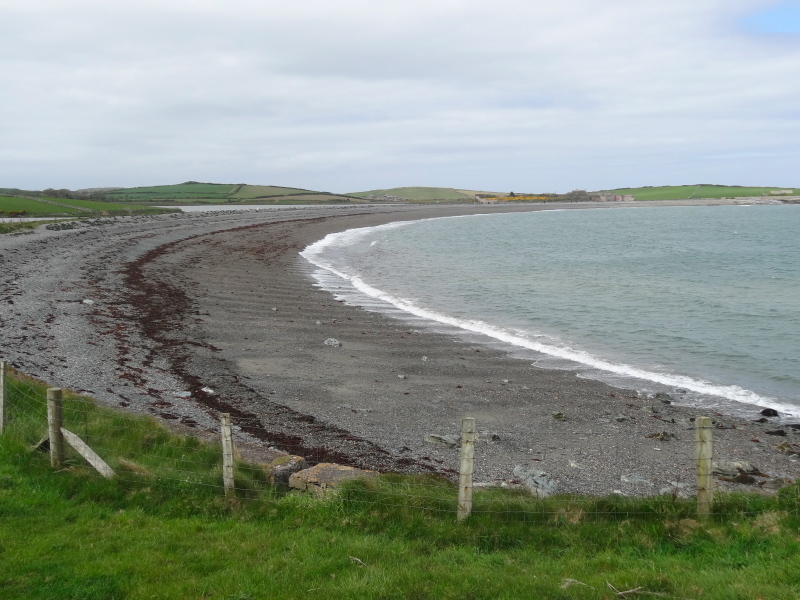 However, it tries to keep close to the coast for as long as possible, leading to a lollipop-shaped loop around the last headland before coming back through the same gate. 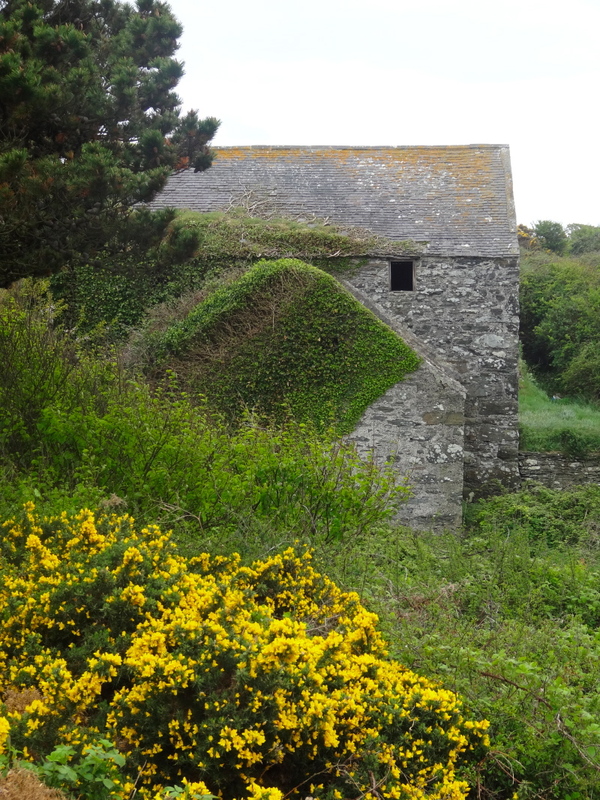 At the far tip of the lollipop, as it rounds the small headland, I see, by a small shack-like building, a person standing, swathed in billowing waterproofs, head buried in a thick trapper-hat, scanning the sea with binoculars. 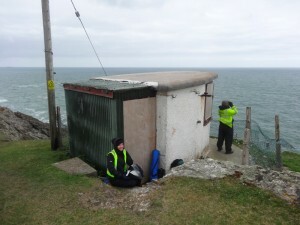 Behind a young woman squats in the lee of the shack, a clipboard with weather-proof cover on her knees. They are employed by a company, Jacobs, to count birds; the young woman is training, but later in the summer she will be standing there, binoculars in hand. At first I assumed that this was an environmental impact assessment for some new shore-works for the power station, but now I wonder whether it may be for a wind farm1. 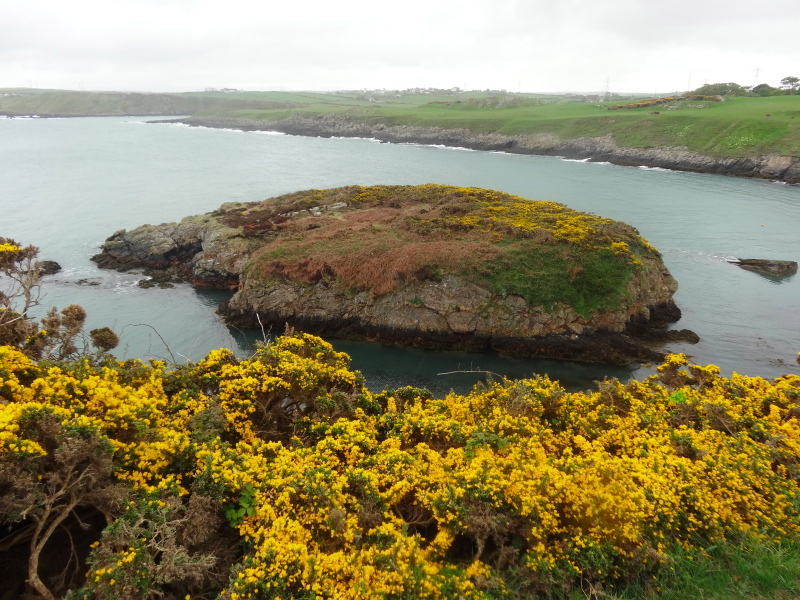 As I head back from the loop, I meet two women dressed in black waterproofs and overtrousers, who I later learn are Kim and Donna, sisters from British Columbia, walking round some of the Anglesey coastal path while their husbands visit antique shops and pubs. I will call them the ‘ladies in black’. I follow the path inland, which crosses fields, and through open scrubland, before heading onto a thick pine wood. I keep seeing structures, like two Himalayan prayer flags on T-shaped arms, which I guess are collecting windblown dust for radiation analysis. 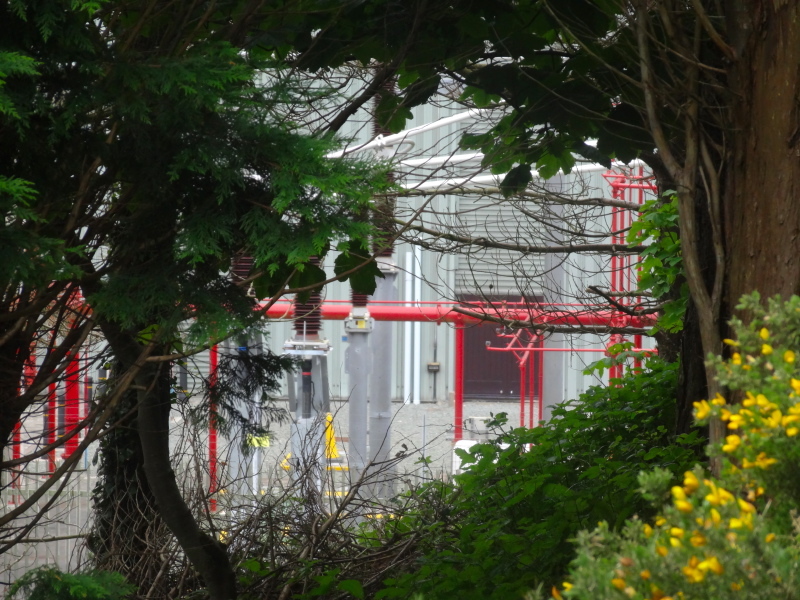 Later I see a more complex device, like a tiny electricity substation, which says explicitly it is for Gamma Ray monitoring in case of emergency. 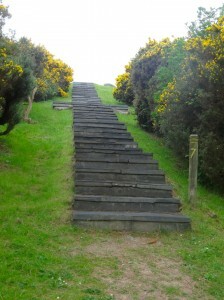 The path wends its way through the pine wood, before taking you up a set of slate steps, edged in non-slip roofing felt. 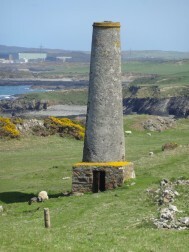 It is as if you are ascending an Aztec pyramid, and at the top, at the place of sacrifice to the sun god, is instead a viewing area, so that you can take in Wylfa in all its glory. It is a cul-de-sac and you have to then turn round and so I wonder if this was part of the deal, "sure you can put the Coast Path through our land, so long as it goes to our view point". From the viewpoint I notice that the ladies in black have not come back through the lollipop neck, but instead are following a tarmac path at the perimeter of the fence. 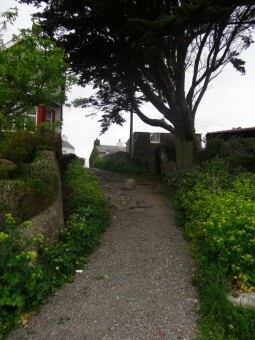 It looks a far more direct and seaward path than my own. So I descend the Aztec steps and continue out of the woods into a gorse scrub area under the massive high-voltage pylons, their crackling in the damp air harmonising with the deep hum of the turbines. The way is not totally clear, as there are multiple ways, but I am sure I am right … until I meet the ladies in black coming towards me. They had been shooed off the perimeter path, and then came to a post with two arrows both pointing towards the path I was coming from. I turn round and we go back together for a while, but then re-check maps and decide that the way they were coming from and I’d been heading for must be right. I set off at my slightly faster pace, and promise to come back to tell them if there is a problem. When I get to the end I realise the problem: coming out from the path it is obvious that one of the arrows means to join a roadway; however, coming, as they had, from the forbidden path, the arrows looked as if they are pointing the same direction. The road leads past the Visitor Centre. I am torn. Part of me wants to get away from the nuclear power station as fast as possible, and part of me, like taking the path between A55 and railway, thinks that going in is part of the experience. The latter wins and I branch out to the Centre, and even plan to have a cup of tea in their café, but then, "No dirty footwear", the sign declares, with an image of a walking boot; walkers definitely NOT welcome here. 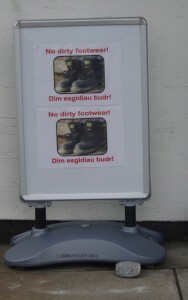 So, if you ever think of walking 300 miles in order to learn about the benefits of clean, modern nuclear power for Wales, to be persuaded that the benefits outweigh the dangers, to be awed by the statistics of megawatts generated, houses lit, to be intrigued by the intricacies of control rods and fuel cells … don’t bother. I had been trying all morning to take a photograph of Wylfa that makes it look in some way romantic or beautiful, deliberately to counter my own natural reactions. I try framing with gorse, or against landscape, but none work. 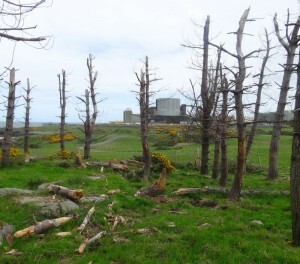 However, starting to pull away from the power station, there is a stand of dead fir trees. Now I am sure the dead trees are nothing to do with radiation, but I couldn’t resist a photo of Wylfa taken through the dead trees. Can I help it if the romantic photos fail and only the ghoulish and foreboding ones work? 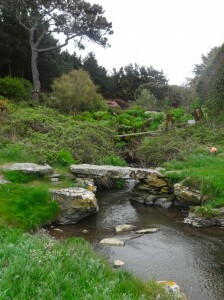 The path once more meets the shoreline, and at the head of a tiny creek, a clapper bridge crosses a small stream with the remains of an old watermill standing guard. And then I notice that the watermill is set in a stand of gunnera. 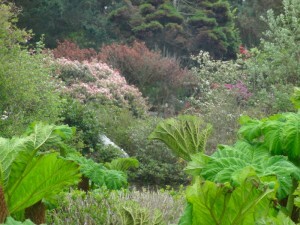 But not just gunnera: looking upstream, here is a whole garden with specimen trees and Himalayan flower bushes. 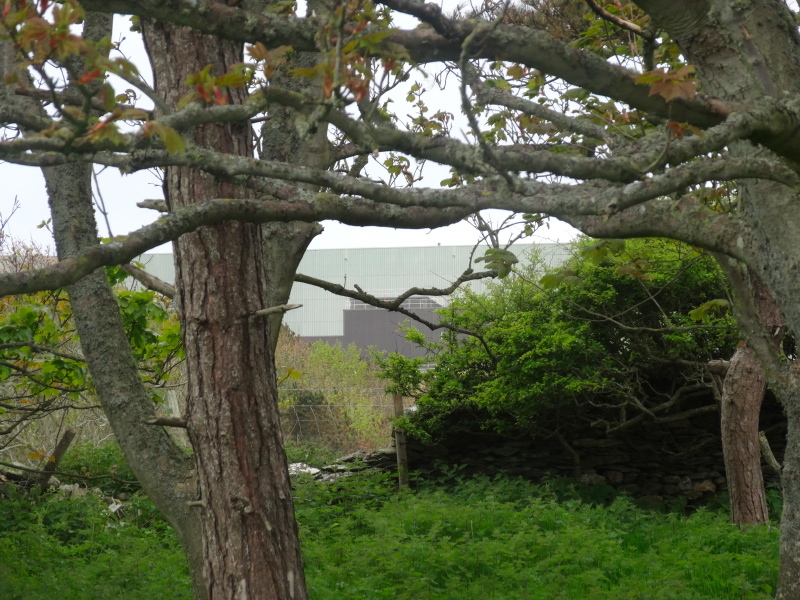 While Wylfa only finally disappears when you turn Carmel Head, the generator hum fades after a mile or so, and gradually it is possible to focus on other things. 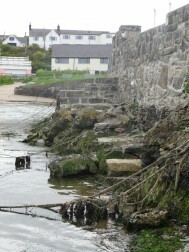 Cemlyn is a near-mile-long shingle bar damming a stranded lake above. 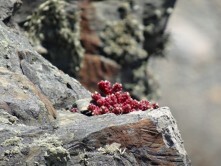 It turns out to be a combination of natural forces and human shaping. In the early 19th century a massive storm threw up the shingle bar, but originally this created a salt marsh area. It was only when a weir was built that the current freshwater lake was formed. 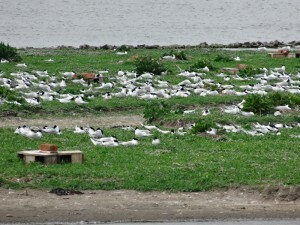 However, this unnatural lake has become a haven for many birds including massive flocks of Arctic Terns. 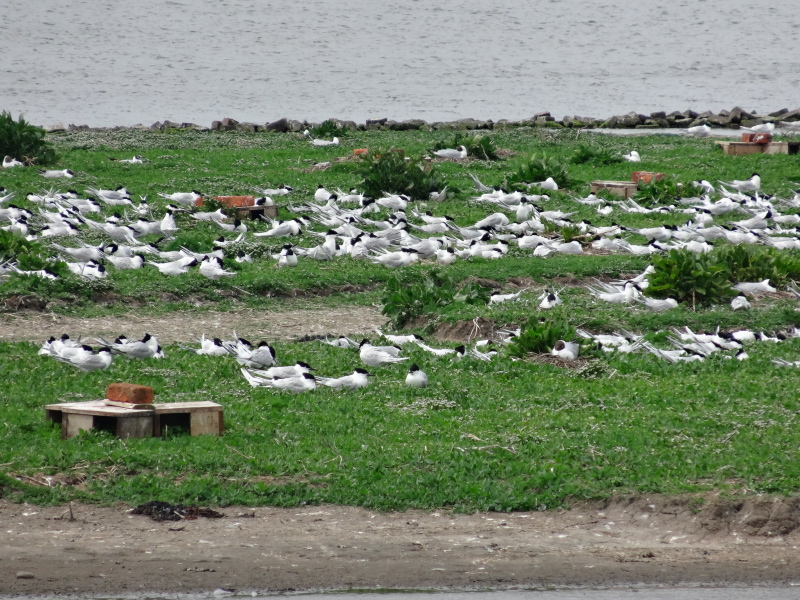 As I plod across the shifting shingle, I pass ornithologists with massive monoculars on tripods, and one man with sound recording equipment, clearly trying to capture the chattering of the colony. Having crossed the bar I feel sufficiently far away from the nuclear plant to eat my, very belated, breakfast. In my head I know that there is unlikely to be any contamination from the plant landside, so long as it is working properly. Still I have an overwhelming sense of contagion when I am nearby … yet, oddly, I would have happily had a cup of tea in the visitor centre! 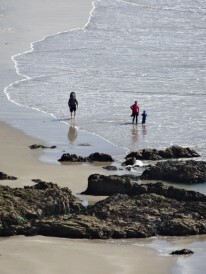 A lady picks up rubbish using one of those long-handled grabs, and I realise it is the same person who was on the beach at Cemaes earlier. 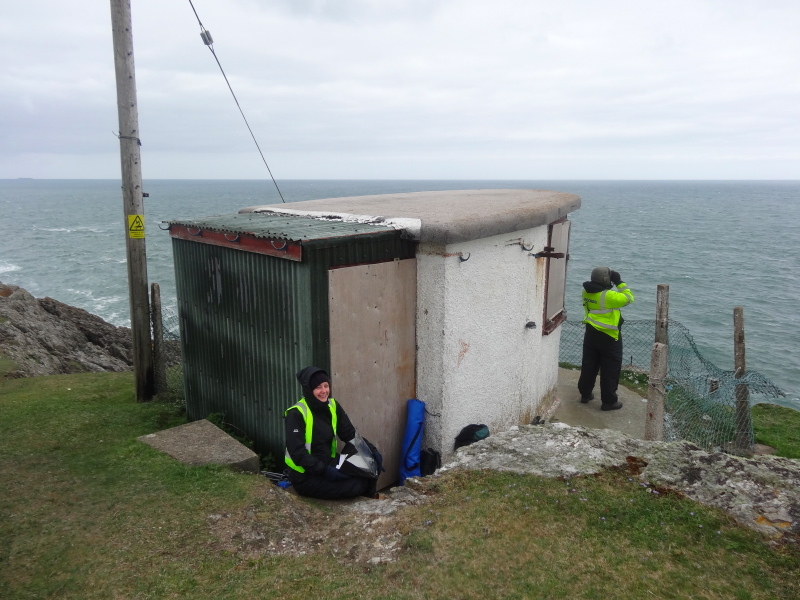 She explains that she has a rota, starting each morning at Church Bay, where I’d parked the van earlier and would finish the day, followed by Cemaes and Cemlyn. She also tells me about a woman, Jackie, whom she had met a year ago. 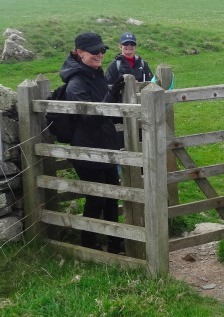 Jackie and her dog were walking the Coast Path in support of Air Ambulance, but also Jackie was eyeing up the potential for going round on a horse. Some sections are on bridleway anyway, but I certainly wouldn’t like to be astride a horse along some of the cliff paths! The two ladies in black arrive while I am talking, and this is a pattern through the day, I overtake them while walking, but I take some diversion to see something, stop to take photos, or this time to talk. This makes clear why my normal free walking pace is three and half to four miles an hour, but my actual pace on the ground is closer to two miles an hour. I am taking over 250 photos per day, and that alone means, on average, a photo every hundred yards. At normal pace I walk a hundred yards in a minute, it is easy to see how taking a photo significantly adds to this time. 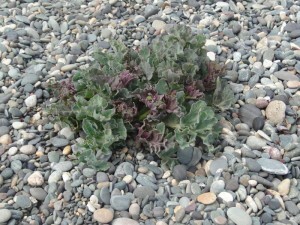 The coast is a series of rugged rocky inlets, the path mostly wide and grassy along the cliff top. 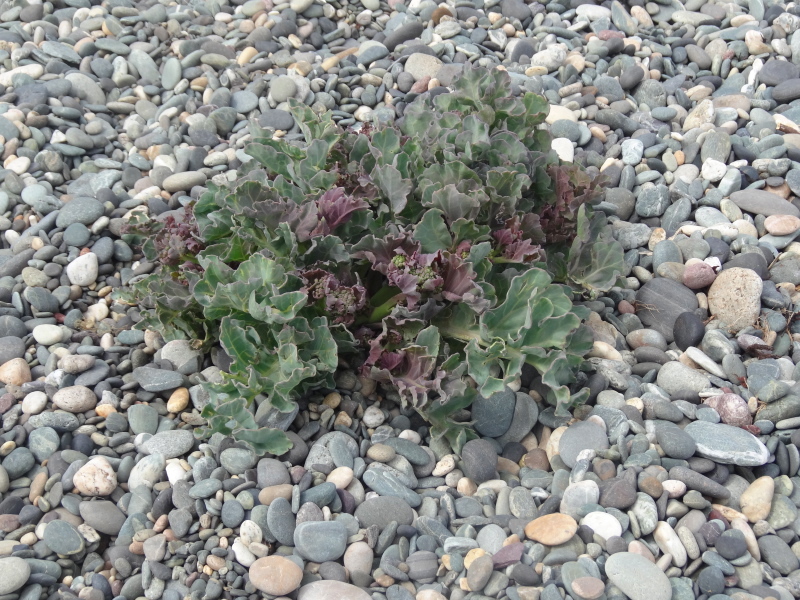 To sea is the small rock of the ‘West Mouse‘ with a lighthouse on top, and further out to sea ‘The Skerries‘, with what appears to be a much larger lighthouse complex. I assume from its name that the latter extends further beneath the sea as well. 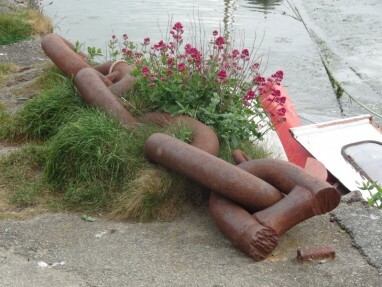 Long before the lighthouses, the Royal Yacht of Charles II, the Mary, was wrecked here. 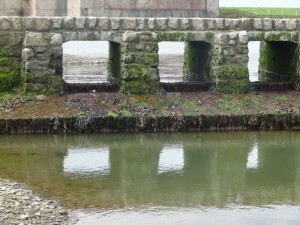 On the coast itself, a line of three structures appears. The first is a tower. 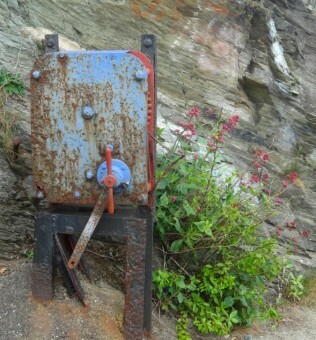 It reminds me of one of the tin workings in Cornwall, and I assume it is some sort of metal smelting, or similar. However, clearly the rocks here are not as mineral rich as those elsewhere, as this was the only sign of old industry during the day. 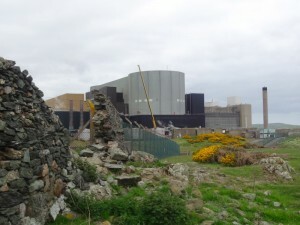 Wylfa‘s site does not require any natural minerals or ores, just stable quake-free rock, a water supply for cooling and not too many local people to reduce casualties in case of disaster. Either side of the chimney are two other tall triangular structures, which I, at first, took to be two further whitewashed chimneys. 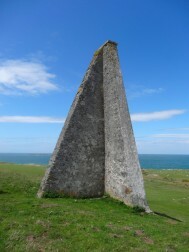 However, as you draw closer they are tall, narrow flat white triangles with a cathedral-like stone buttress behind each, a bit like a Mesolithic film set. 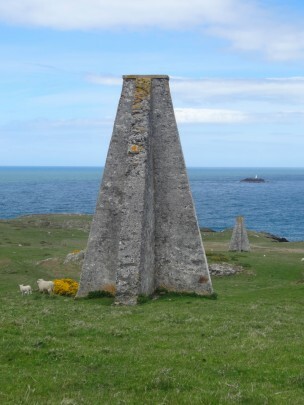 I realise that these are aligned with the little Mouse lighthouse and, high on the clifftop and hillside, can be used as sighting lines for ships at sea. 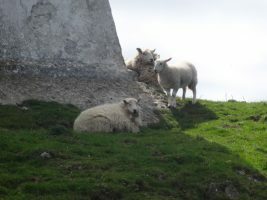 When I next pass the ladies in black, who overtook me while I was climbing up the hill to get sightline of markers and lighthouse, their guide book says these are known as the ‘White Ladies‘. 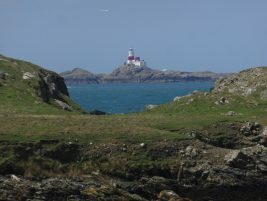 The path cannot hug the cliffs around the end of Carmel Head, as they are too sheer, but as it cuts off the last jutting spur, it is possible to walk along the top out to the far point and stand as far as possible at the north west tip of Anglesey main island. It is now that Wylfa is finally left behind and Holy Island appears, with its breakwaters and chimneys, although the latter are far across the water. I did not see any ferries arrive or depart, I guess it’s still the winter timetable, with few midday sailings. 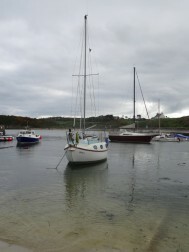 However, close to hand a yacht sails round the Head. 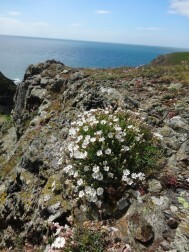 I have been amazed at the clifftop flowers across all the Anglesey coast, with primrose-coated fields, those small tufty red-pink flowers that often grow in rocky places, but in far greater profusion, bright yellow aconite-like flowers and tiny star-shaped light blue-lavender flowers, which one of the information boards named, but I of course forgot. However, nothing prepared me for the change as I turned Carmel Head and the final stretch of coast between there and Church Bay. We move from north-east facing cliffs to west facing, warmed by the Gulf Stream, yet protected from the worst of the cold winter winds. It is a garden. 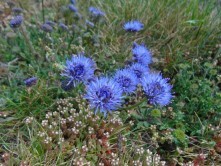 Cliffs tumble with almost unbroken carpets of flowers, their grassy tops flour dusted or maybe fairy dusted with those blue star flowers, and each rock or post fur-tipped with lichen. The rock in this area is old, 570 million years, not as old as Tiree‘s Lewisian Gneiss, but still too old for fossils, and, I assume, hard. 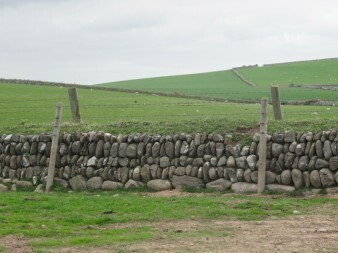 So the clifftop field walls are made of piled packed earth. 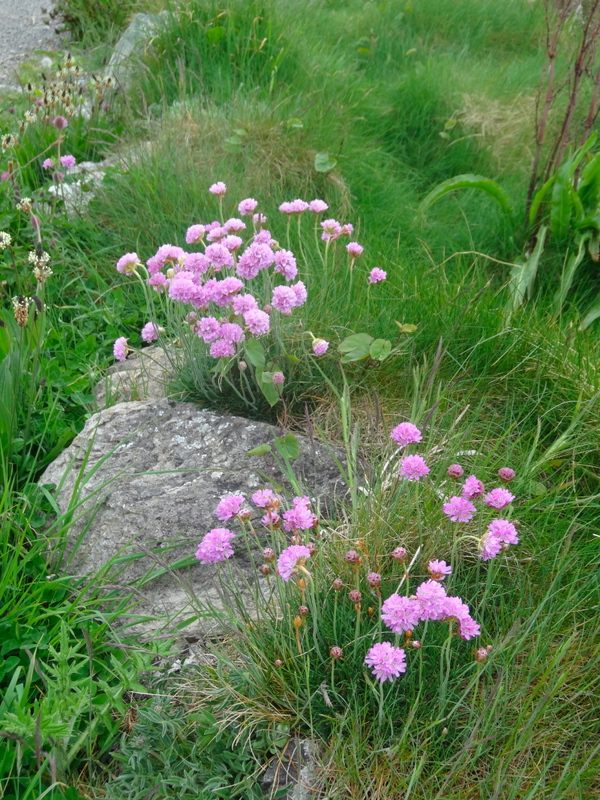 A few, those lower and closer to pebbled beaches, are neatly faced with tight packed round stones, but most are simply earth edged and make their own home for flowers and sedums. 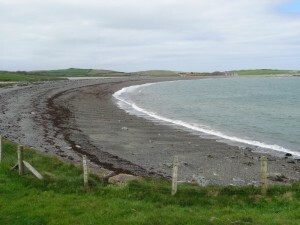 Church Bay is the first sandy cove and safe landing place after Carmel Head. The only possible landing before then is a single shingle-filled bay, with a trapped lake behind, but the way into it would be treacherous indeed, with sharp-edged rocks either side and a huge natural arch. 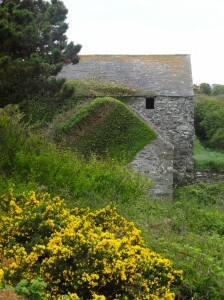 Church Bay is named after the steeple of the church that rises on the hillside, but in Welsh it is Port Swtan, the port of whiting, the local catch in days when fishing was a major part of life. 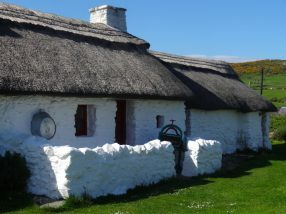 There is a small heritage centre, one of the remaining thatched ‘tyddyns‘, a small dwelling that was once a farm with a few acres of land, where the occupants scratched out a living from the land and sea. 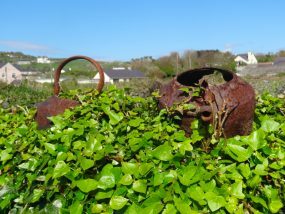 The centre was closed the day I was there, but walking round the outside, there is a small cottage garden, its walls topped with old kettles and other ironmongery … I’d guess not how the original owners would have decorated them, but picturesque nonetheless. 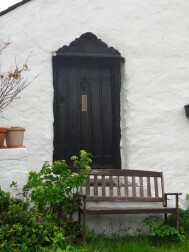 Your writing creates a lovely sense of place. 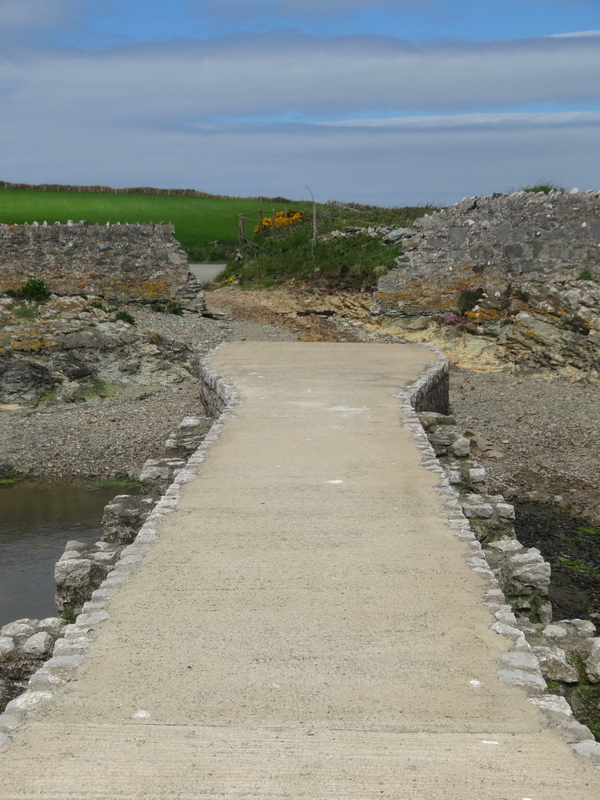 Given the juxtaposition with Wylfa, I especially loved, “The path once more meets the shoreline, and at the head of a tiny creek, a clapper bridge crosses a small stream with the remains of an old watermill standing guard. And then I notice that the watermill is set in a stand of gunnera. But not just gunnera: looking upstream, here is a whole garden with specimen trees and Himalayan flower bushes.” Makes me think Heligan’s moved north! Hope the sun’s shining on your boots. Hi Alan, Hope the walk’s going well still and you’re enjoying every bit. 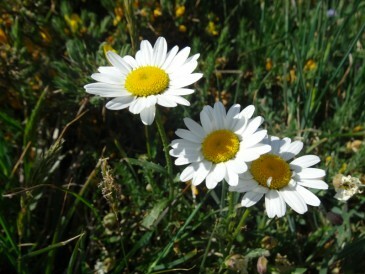 Nice to meet you on that rather windy day! And yes we are collating data for the EIA for the proposed new power station there. Best of luck with the rest! Ah, I’d got the environmental impact, but forgotten about new power station, so thought about wind farms … both controversial in different ways!